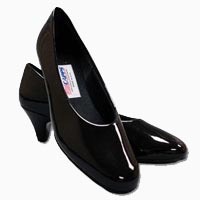 The Formal Uniform is worn for social events in the evening. The individual items that make up the Formal Uniform for regular members, and for associate members is illustrated below. Specific regulations regarding this uniform are provided following these illustrations. The regulations regarding the Formal Uniform for both regular and associate male members is provided below. Scarlet Mess Jacket or Scarlet Blazer: The scarlet mess jacket is worn with this uniform, but the red blazer may be worn as an option due to the high cost of the scarlet mess jacket. The jacket or the blazer should fit properly and should not "pull" when buttoned. Both the mess jacket and blazer are available either through the Ship's store or through private clothiers. Buttons and Accessories: The mess jacket requires a special set of eight Marine Corps League buttons which are sewn onto the jacket—three on each side of the the front of the jacket and one on each epaulette. Regular or associate member collar devices, as appropriate, are affixed to the mess jacket in the locating holes on the jacket's collar. In addition, the jacket is fastened in the front with a linked pair of Marine Corps League buttons known as a "chain link." 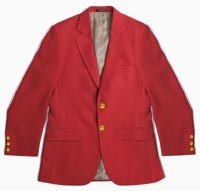 If the scarlet blazer is worn in lieu of the mess jacket, there will be two (2) large Marine Corps League buttons on the front of the blazer, and three (3) small Marine Corps League buttons on each sleeve. 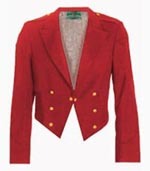 Collar devices are not worn on the scarlet blazer, even when it is worn as part of the formal uniform. 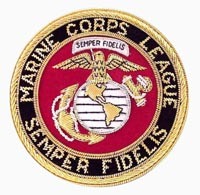 Blazer Crest: The Marine Corps League blazer crest is worn only by regular members and is not authorized for wear by associate members. As part of the formal uniform, it is only worn on the scarlet blazer and is optional when medals are worn. The blazer crest is worn on the left breast pocket, about ¼-inch below the lower half of the breast pocket cuff and centered on the pocket. The bullion-embroidered blazer crest may be attached using the three pin and clutch-back fasteners that are affixed to the back of the crest, or through the use of a blazer crest pocket insert. 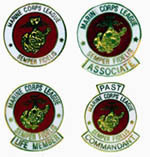 In lieu or an embroidered crest, a commercially sold plastic sleeve insert with a permanently set Marine Corps League seal may be worn in its place. 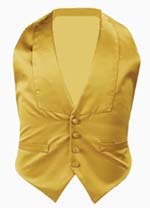 Gold Cummerbund or Gold Vest: When the scarlet mess jacket is worn a gold cummerbund or gold vest shall be worn. Both of these items are available through the Ship's Store or The Marine Shop. 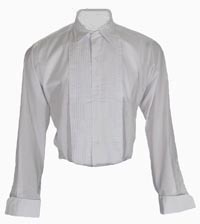 Formal Shirt and Accessories: The shirt will be a formal pleated shirt, with a standard collar and no ruffles. Accessories to be worn with the formal shirt are a set of three gold studs and a pair of gold cuff links which are adorned with the Marine Corps emblem. Bow Tie: The bow tie should be a solid-color black tie. A clip-on tie may be worn in lieu of a standard bow tie. Trousers and Belt: Black tuxedo trousers are worn with the scarlet mess jacket, but plain black trousers are an accepted option. 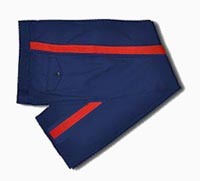 As another option, regular or associate member blue trousers, as appropriate, may be worn with the scarlet mess jacket. 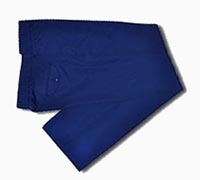 However, when the scarlet blazer is worn as part of the formal uniform, blue trousers are not authorized and only black trousers shall be worn. The belt to be worn with the black trousers can be either be a 1½-inch or 1¼-inch wide black leather belt. The wide leather belt is worn with the large square buckle, while the narrower belt is worn with the rectangular buckle. Both buckles are gold in color and have the Marine Corps emblem on them. If blue trousers are worn with the scarlet mess jacket, a Marine Corps khaki web belt and brass buckle should be worn. 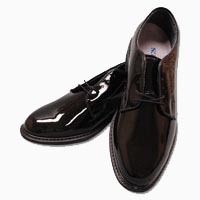 As with all other uniforms, the length of the trousers should be such that the bottom cuff of the trousers just touches the top of the heel sole of the shoes. Other: Miniature medals may be worn on either the mess jacket or the blazer, the latter only when being worn as part of the formal uniform. Three full-size medals may also be worn on the scarlet blazer in lieu of miniature medals, however, the full-size medals must be mounted on a single ribbon bar. In any case, the medals worn must either be those of official military awards or those of Marine Corps League awards since commingling of these two types is never authorized. The regulations regarding the Formal Uniform for both regular and associate female members is provided below. Necktie and Tie Bar or Neck Tab: Either a black satin cross-type tie (neck tab) or a men's black bow tie shall be worn. If a bow tie is worn, it should be a solid-color black bow tie. A clip-on tie may be worn in lieu of a standard bow tie. 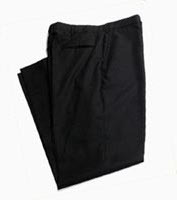 Skirt or Slacks: A black skirt or black slacks shall be worn with the formal uniform. 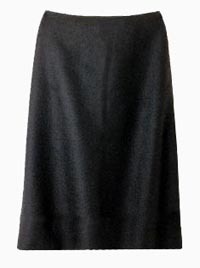 If a skirt is worn, it shall be a black, straight, ankle-length type with a slit on the left hand side. The slit should be no higher than mid-knee or the bottom of the kneecap. When black slacks are worn, a 1½-inch or 1¼-inch wide black leather belt shall also be worn. The wide leather belt is worn with the large square buckle, while the narrower belt is worn with the rectangular buckle. Both buckles are gold in color and have the Marine Corps emblem on them. As another option, regular of associate member blue trousers, as appropriate, may be worn, but only with the scarlet mess jacket. If blue trousers are worn with the scarlet mess jacket, a Marine Corps khaki web belt and brass buckle should be worn.